Is Your Software Too New? It's good to offer software applications that are new. It's dangerous, however, for companies to sell products or services that are too new. So say Robert M. McMath and Thom Forbes in their book "What Were They Thinking? Marketing Lessons You Can Learn from Products That Flopped." Unless a new product strikes a "chord of familiarity," the authors explain, it will have difficulty in the marketplace. If you need to describe your unusual software by using unusual words, then people are unlikely to find your website using Google, Bing, or the other search engines. Software buyers are comfortable typing words into search engines that describe the problem that they're trying to solve, or the result that they're trying to achieve. If the keywords and key phrases that describe your new software application don't fit into this search engine paradigm, then people will be unlikely to type the words into Google or Bing that will send them to your website. If you've written an unusual, difficult-to-describe program, then compare it to more common applications and explain the differences. This will make it easier for people to find you in the search engines. For example, if you have a program that is similar to a word processor but which has many additional features, then use phrases such as "Unlike a simple word processing program,..." and "Much more powerful than a word processor,..."
Comparing your new program with existing types of applications will make it easier for people to find you on the software download sites. Although fewer and fewer people are visiting download sites to find software, these sites can still generate some interest in your applications. When you upload your software to the download sites, you have to choose a category for your listing. For your unusual new application, select the category that is closest to the correct one. And use the description field to explain why your program is much more powerful than other applications in that category. It's unlikely that you'll be able to convince the download site managers that they should create a new category for your exciting new application. It will be a lot easier to shoehorn your program into an existing category, and tout its superior features and benefits. Describing your new application as part of an existing category of programs will make it easier for magazine and newspaper editors, columnists, reviewers, and bloggers to tell their readers about your software. McMath and Forbes remind us that we need to communicate clearly. Don't assume that your prospects or customers will understand what you're offering, or how they can use it. Explain everything. Take this same approach when dealing with editors and other members of the press. Use phrases like "Without having to purchase four separate applications, you can..." to explain why you've characterized your program as a member of one particular category, even though it offers much more functionality than other programs in that category. There are computer, tablet, and smartphone users who enjoy living at the leading edge of technology. Describing your software as unique will appeal to them. To sell your application to the largest number of buyers, however, consider a way to find the chord of familiarity that will make prospects comfortable with your latest creation. Phil Dusenberry, the author of the book "Then We Set His Hair on Fire," tells us that he maintains his creativity by writing. He likens writing to weightlifting. You get better and better at it, the more you practice. Software developers who haven't launched a blog for their microISV company may think that writing is hard work. I'd recommend that you launch a blog and start posting. Nearly four years and more than 400 postings after launching this Software Marketing Blog, I can tell you that it's a lot easier - and a lot more fun - each week. Subscribe to this blog to get a steady flow of software marketing ideas. And start your own blog as a way to sell more software. "The road to chaos is paved with improvements." ... quotation by Jack Trout from his book "The New Positioning"
To learn more about chaos, or to learn more about Trout's book, visit my Software Marketing Glossary. It's hard to find good information about how to close the online software sale. By contrast, it's simple to find high-quality ideas about how to close the car sale, the house sale, and many other face-to-face sales. Fortunately, it's simple to translate many of these sales ideas from other industries into the world of the software development industry. Here are five ideas on how to close sales online, resulting in greater profits for your microISV. The assumptive close is the sales technique that every rookie salesperson learns during their first month on the job. With the assumptive close, you don't ask for the sale. Instead, you just start writing up the order. You assume that the prospect is there to buy your product or service. And by the time you've taken all of their information, all you need is their "okay." Every experienced salesperson will tell you that a prospect's "okay" is much easier to get than their "signature." You can use the assumptive close online to boost your software sales. Create a process that asks your website visitors for information that will help you select the edition of your application that is best for solving their problems. Collect the information, and present a proposal. At that point, all you need is their "okay" to complete the sale. Attitude matters. Many rookie face-to-face sellers do a miserable job of trying to close the sale. They nervously recite a long list of product features. And when they run out of things to say, they ask meekly, "Well, what do you think?" Online, too many sellers do something similar. They create a huge list of bullet points. These lists typically start with exaggerated claims about being the most powerful, easy-to-use software on the planet. The lists often end with the obligatory mention of offering context-sensitive help screens. Following the lists are the "buy now" buttons. If you project the image that you're offering the most effective and affordable solution to an important problem, then your prospects will respond accordingly. Assume that they're going to make a buying decision, and many more of them will. Instead of asking for the sale, many salespeople have learned that they should ask prospects to make a choice. Car salespeople ask, "Do you like the blue sedan or the red one?" Home sellers ask, "Do you like the bungalow on the huge lot, or the condo with the modern kitchen?" By asking prospects to choose, you're tasking them with the tiny job of stating their preferences. It's much easier to get them to say which product or service they'd prefer than to get them to agree to buy something. Once they've said that they like the blue sedan or the white bungalow, you're no longer trying to sell them something. You're simply the order-taker who helps them with the paperwork for the choice that they've already made. You can use this closing technique online, too. Craft a sales presentation that introduces the Light, Standard, Professional, and Enterprise versions of your application. For simple programs, create a product-comparison page that leads prospects to the right software for them. For complicated programs, create an interactive form that helps them choose the software that best solves their problems. Once they've decided which edition is best, send them to a product page that talks about only that version. And refer to that version as the solution that they've selected. Once they've made up their minds, you can help them with the paperwork needed to complete the sale. Give them one last choice. Would you like to pay by credit card, or would you prefer to use PayPal? Most people buy things because of emotion. After they buy, they use logic to justify the purchase. In face-to-face selling, if you can convince prospects that there's more danger in not making a decision than in making a decision, you'll close more sales. For years, salespeople have been using this technique to sell more life insurance, more encyclopedias, and more cookware that costs a lot of money and preserves much of the food's vitamins. If you're selling software online, you may be able to use this technique to increase your application sales. If you're selling a home inventory program, for example, stress the danger of doing nothing. If you're offering virus-prevention programs, then emphasize that inaction is more dangerous than making a decision - even a hasty decision. When selling face-to-face, successful salespeople mention product features. But they put even more emphasis on discussing their products' benefits. One of the most effective ways to close more sales is to paint prospects into a picture in which they see themselves enjoying the benefits of the things that you're selling. Real estate agents paint a word picture by telling home buyers that they'll enjoy owning this home. "This summer, when you're watching your children swim in your pool, and you're cooking your food on your grill, you'll be happy that you decided to buy your new house." The best technique for painting a word picture is using second-person sentences. Use you/your/you're over and over, and get the prospect involved in the painting. You can use the same technique online. But the more you weave you/your/you're pronouns into your sales presentation, the fewer keyword-rich nouns and noun-phrases you'll use. That will result in the search engines sending you less traffic. For example, if you're selling a complex database reporting application, you could paint a word picture by saying "You can use the software to manage your SQL databases, control your company's finances, and manage your firm's security access." Perhaps your prospects will find such a statement warm and fuzzy. Google and Bing, however, will be happier if you phrase your sales message differently. You could say "The software makes it easy for database managers and network administrators to control your SQL databases. The company's accounting director and chief financial officer can use the application to control cash flow and finances. Chief security officers and auditors use the software to ensure stability and security." Such a description is less warm and fuzzy for humans, but wonderful for search engines. There's always a trade-off between writing personalized messages for prospects, and crafting keyword-rich information that will help you with the search engines. Measure the results of your current sales message. Make changes, and track the sales results. In face-to-face selling, it's a common practice to have flyers and brochures that list the names of prominent people and enterprises who have bought the product or service being offered. The same technique can be used to close the sale online. Use testimonials and endorsements to add credibility to your company and products. 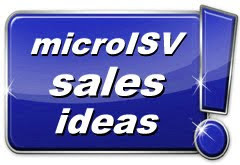 There are proven techniques that microISVs can use to increase software sales. It's difficult to find books about selling more software. But there are hundreds of valuable general books about increasing sales. Find them. Read them. Translate the ideas into the world of the software development industry, and you'll sell more software.